Killamarsh Secondary Modern School. 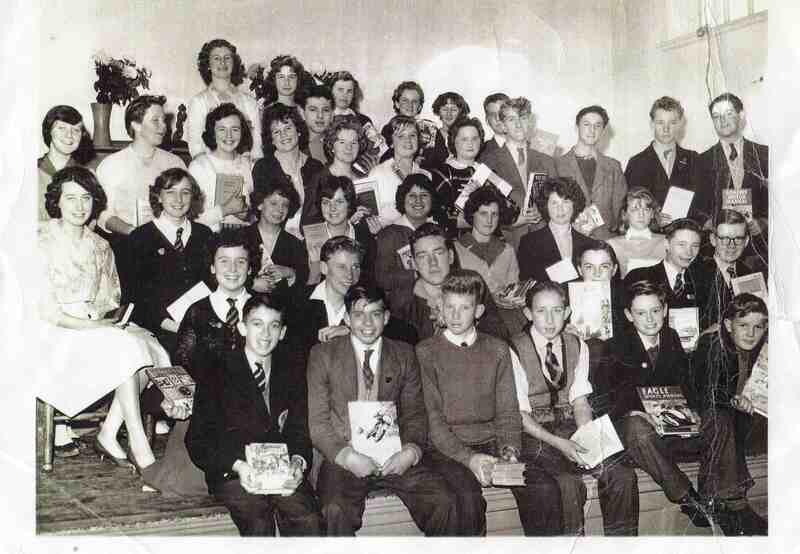 Prize Giving 1960-61. Can you give more names? See note below. Photo courtesy of David Nicholls. To the right of Alan Armstrong is Terry Burdett. Back row, far right is Pete Draper. Second row, fifth from left is David Nichols. Third row, left seat is Paula Hoult now Paula Emsen. Fourth row, second from left is Hazel Drackett, third from left is Jenny Roper, sixth from left is Janet Marrison. Great photo brings back many memories. My surname is Megahy not Megahay. I still have the prize that I was presented with. 4th row: Maureen Silver, Hazel Drakett, ? ?, Marjorie Roper, David Drakett, Dianne Lynch, ? ?, Janet Marrison, Pete Revans, Alan Porter, Alan Armstrong, ?? 3rd row: ? ?, Janet Barber, Joan Smith, Pat Smith, Sandra Haynes, Sandra Garfitt, Linda Watts, ?? Front row: ? ?, Barry Morris, Wilfred Lindley, Dennis Powell, ? Martin, Raymond Godber.